For unto you is born this day in the city of David a Saviour, which is Christ the Lord (Lk. 2:11 KJV). The meaning of Christmas has been clouded with so much clutter from the world. However, Christmas, as many other feasts, has at least two components. The first is the festival which deals with the celebration- the party, the joy, the eating and drinking, the get-togethers with family and friends. The second component is the purpose of the celebration, which gives meaning to the festivities. The Old Testament clearly shows us that our God delights in celebrations. He loves seeing His people come together to eat, drink, rejoice, celebrate, and give gifts. Since Jewish feasts came with so much celebration, certainly Christmas deserves more! Every Jewish feast was done with a purpose. They didn’t get together with family just to drink and have a party. Jewish feasts were not empty celebrations; they were celebrating something meaningful. The same is true about Christmas. The meaning of Christmas is to celebrate the birth of the Savior, in the city of David. Christmas finds its full impact and meaning when both components are put together. It is amazing to see how hard the world is trying to take Christ out of Christmas. As Christians, it is our responsibility to reinforce the meaning of Christmas to the world. Is so much joy and celebration around the world good for Christmas (Luke 2:10)? What gives meaning to the celebration? What would make the celebration empty and void? There is pressure to pull Christ out of Christmas. Drive the meaning of Christmas down into the hearts of your children. After all the candies are eaten, and gifts are given, take a moment to intentionally think about why you celebrate, so that you do not lose yourself in the midst of the activities. Could you thank the Lord right now for sending a Savior to be born for us? Recommended Read: Thou Hast Found Favor with God. Foundational Read! 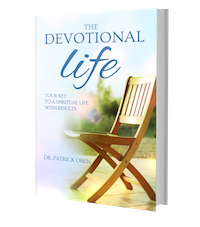 : What is a Daily Devotional?